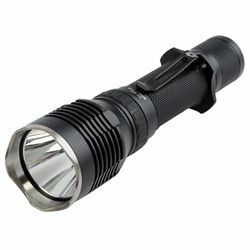 The Maelstrom MMX with 360 pressure switch is designed to let you have the right amount of light when you need it. The MMX-360 can memorize your two preferred output modes out of eight possible modes for immediate access. That way, you'll know exactly how bright your light is going to be every time you switch it on, without having to toggle through multiple options. The tactile feel and complete 360 degree coverage of the pressure switch ensures that whenever you need to change modes, you won't be fumbling to find the switch. Includes batteries, lanyard, spare o-ring, holster, non-crenated spare bezel, flat grip-ring spacer.